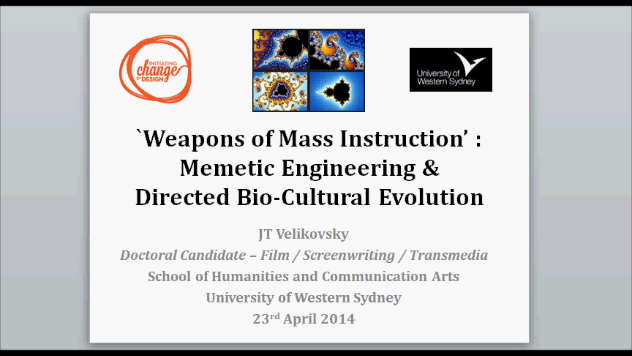 A filmed PowerPoint presentation of a paper: “Weapons of Mass Instruction: Memetic Engineering and Directed Biocultural Evolution” (40 mins) given by JT Velikovsky at the `Initiating Change by Design’ Symposium, at University of Western Sydney in 2014. From Data To Action – The Power of Adoption Papers! As participants, we interviewed – and `adopted’ a resident from Riverlands Sydney (I lucked out, and got a lovely cab-driver from the Riverlands who I interviewed on the way to the workshop) – and, after a fun day of brainstorming, and led expertly by Tom and Angela through 9 x different (and also really fun) Creative / Research / Data-Visualization processes – we then all finally had a hot 15 minutes, to make a prototype of our individual design concept aimed at our `adopted’ user, addressing: Sustainability and Community and Cultural Engagement in the Riverlands – or: “How can we strengthen (design, reinforce, build) a sense of IDENTITY in the Riverlands, Sydney, by activating public engagement?”. Below is my (created in 15 minutes! No waiting!) concept for: Graffiti on the roads, showing art trails and community cultural events… (As Tom observed – sort of like: Google-Maps-for-real!) And, frame left, is `Riverlands Pirate Radio’ APOC (Analog Proof Of Concept – i.e. 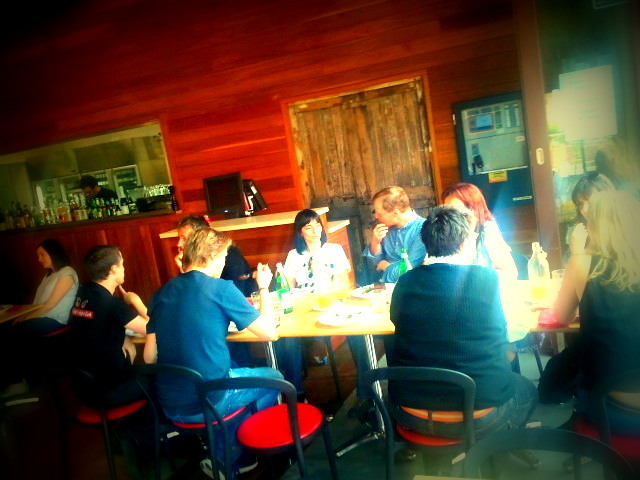 Frank Davey’s & Tess Rapa’s group’s prototype) which, I also thought was a fantastic idea. On the afternoon of Day 1, we also had a 1-hour workshop on the Digital Humanities, chaired by Assoc Prof Hart Cohen, which was terrific, and a really illuminating session. Also an excellent book we received at the Seminar is: Visualising Information For Advocacy (written and researched by Stephanie Hankey, Tom Longley, Marek Tuszynski and Maya Indira Ganesh, Tactical Technology Collective, Bangalore, 2013). This book is a terrific resource for anyone using visual information for influence, whether an activist, educator, or anyone aiming to spread memes (ideas, processes, products). I was particularly impressed with page 55 (Children’s World Map), p 79 (On Reducing Your Water Footprint), and p133 (Surface Area Required To Power The World). `It’s the story of the food we waste and, most of all, the food we can save. 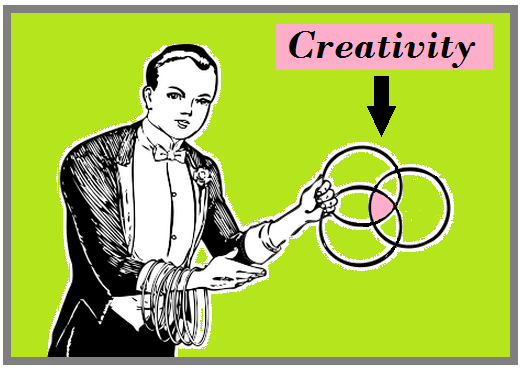 And, perhaps, see also: StoryAlity #71 – On Consilience and Creativity for an Amazon-linked bibliography of many of the key works that have also influenced my ongoing research on cultural (including film) `virality’, and memes in culture in general, across all domains and disciplines. Creativity. It’s not what you think!